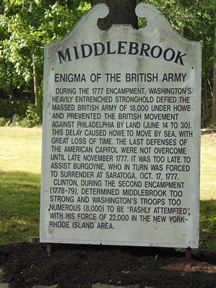 The name of our chapter comes from Middlebrook Encampment where Washington stationed his troops in 1777 and 1778-1779 to protect the Somerset/Middlesex Counties area from the 17,000 British soldiers garrisoned across the Raritan River in New Brunswick. A series of encounters known to history scholars as “The Forage Wars,” including the Battle of Bound Brook, weakened British efforts to secure provisions for their troops. Also, the placement of so many men at Middlebrook hampered overall British strategy and caused disruptions that favored the American cause. A section of the encampment called Washington Camp Ground is on the National Register of Historic Places. Historians believe that the first American flag authorized by the Continental Congress, the 13 star flag, was flown for the first time at Camp Middlebrook in 1777. By an Act of the U.S. Congress, a replica of this flag flies 24 hours a day, 365 days a year, and is replaced annually in a special ceremony held on the Fourth of July holiday. We are also one of those chapters blessed with a Real Daughter. Sarah Van Arsdale Van Nostrand was the daughter of John Van Arsdale who served as a drummer boy. She was one of our charter chapter members joining in 1893. Sarah died only a few months later on December 15th of the same year at age 105 and is buried at Cedar Grove Cemetery in East Millstone, New Jersey. Click the link to see a New York Times article written at the time of her 105th birthday celebration. In 1913, our chapter recognized and honored her special status as a Real Daughter by placing a commemorative plaque on her gravestone. As part of a national effort to remember our Real Daughters, a chapter gathering was held recently at Sarah's gravesite with one of her descendants present to keep this very special charter member within our circle. Click here to see her obituary which was printed in the New York Times on December 16, 1893. Contact: the webmaster about the website. Membership information, please contact the chapter.